Discussion in 'Conspiracy Theories' started by Trigger Hippie, Jun 8, 2014. I've seen that map many times and often wondered how it was made. It seems to have been created in the mid 90's by Dr. Michael S. Coffman, the president of Environmental Perspectives, Inc. According to the fine print on the map, it was used to stop the ratification of the Convention on Biological Diversity. That event took place in 1994, so that should give an approximate date to its creation. I found one link that credits Dr. Michael S. Coffman as having prepared the maps and sources the data as coming from various UN studies and treaties. "The Wildlands Project", Wild Earth, 1992,.
the Border 21 Sidebar of NAFTA. The very high percentage of buffer zone in the West is due to the very high percentage of federal land. Dr. Coffman played a key role in stopping the ratification of the Convention on Biological Diversity (Biodiversity Treaty) in the U.S. Senate an hour before the Senate was scheduled to vote on its ratification. His maps and information have been used by local citizens across America to stop the global agenda at the local level. This includes two UN Biosphere Reserves and the designation of at least one river within the American Heritage Rivers Initiative. So it seems like Coffman took the text of the UN convention, interpreted it rather generally, took some other maps of wildlife areas and movement corridors (from the 1992 "The Willdands Project", and marked them as being "little to no human use", etc, based on his personal interpretation of things. The map's intentions seem clear, to me, connecting existing wildlands with areas to be left undeveloped to prevent isolation. Some parts of Michigan have done similar things already (I doubt just Michigan, but I actually know some specifics here). The development boom in Carrolton and Kochville basically closed the path for deer and coyotes to get from the thumb to the interior of the state - there's an almost solid line of development from the Saginaw Bay all the way down past Flint, so for the last 15-20 years we've been having periodic problems with deer and coyotes passing through neighborhoods and farms where they eat crops, attack livestock, damage property, get hit by cars, and harass locals. The coyotes in the area are particularly fearless and tend to be aggressive towards small dogs, and it's always surreal to see a flock of freaked out turkeys trapped in a parking lot with no idea what to do. Several remaining undeveloped corridors were barred from further development to keep the same thing from happening north of here. One landowner got stuck with a lot of useless land nobody would buy as a result, which last I knew was lined with hulled boats carrying signs saying stuff like, "DNR: Damn Near Russia." Colonization—animals are able to move and occupy new areas when food sources or other natural resources are lacking in their core habitat. Migration—species that relocate seasonally can do so more safely and effectively when it does not interfere with human development barriers. Interbreeding—animals can find new mates in neighboring regions so that genetic diversity can increase and thus have a positive impact on the overall population. Although corridors have been implemented with the assumption that they will increase biodiversity, not enough research has been done to come to a solid conclusion. The case for corridors has been built more on intuition and much less on empirical evidence (Tewksbury et al. 2002). Another factor that needs to be taken into account is what species the corridor is intended for. Some species have reacted more positively to corridors than others. A habitat corridor could be considered as a possible solution in an area where destruction of a natural area has greatly affected its native species. Development such as roads, buildings, and farms can interrupt plants and animals in the region being destroyed. Furthermore, natural disasters such as wildfires and floods can leave animals with no choice but to evacuate. If the habitat is not connected to a safer one, it will ultimately lead to death. A remaining portion of natural habitat is called a remnant, and such portions need to be connected, because when migration decreases, extinction increases (Fleury 1997). Corridors can be made in two distinct areas—either water or land. Water corridors are called riparian ribbons and usually come in the form of rivers and streams. Land corridors come on a scale as large as wooded strips connecting larger woodland areas. However, they can also be as simple as a line of shrubs along a sidewalk (Fleury 1997). Such areas can facilitate the movement of small animals, especially birds, from tree to tree, until they find a safe habitat to nest in. Not only do minimal corridors aid in the movement of animals, they are also aesthetically pleasing, which can sometimes encourage the community to accept and support them. You'll find them world wide, in the UK there is the 'Hedgelink' project, which seeks to link various wildlife habitats with one another along the link of traditional hedgerows, often this means letting a hedge grow in a traditionally managed way with a wide margin along side it, 10-15 meters wide. Another successful idea is to use verges along trunk roads and railways as wildlife corridors, this not only helps wildlife but has the added bonus of hiding unsightly motorways, muffling traffic noise and even help soak up exhaust pollution. ... unless they think this is a way the US authorities are planning to loose packs of wolves, armies of bears and swarms of killer butterflies on the unsuspecting populous. To be fair, there *is* a societal cost to ideas like this, and it can hurt people. Like the guy I mentioned in Michigan who thought he was in on the ground floor of a boom town between Midland and Gladwin and instead was stuck the unwilling owner of acre upon acre of squirrel nests (to be fair, the state gave him a chance to sell to them and recoup his costs, but he chose to sue first and was shocked that after he lost the offer was withdrawn). There's a lot of red on that map, and it crosses highways and passes between adjacent towns and so forth. Some of it's wasteland, but it does represent a lot of potentially valuable development areas. Of course, that cost is that you can't have an unbroken line of specialty retailers and fast food from you all the way to the next town, and you'll have to drive through some scenic nature to get there. Which as awful as it is, is a far cry from depopulation and loss of national sovereignty. Off topic. Much of the data used would probably predate Agenda 21. It is actually quite an interesting map looking at it from a European perspective. Sometimes the media gives impression is given of vast urban sprawl in the US, and similar in the UK only a small percentage is urbanised. Actually looks like he took the text of the UN convention, interpreted it rather generally, took some other maps, and marked them as being "little to no human use", etc, based on his personal interpretation of things. Yes. Its a property rights propaganda map...that has made its way down the rabbit hole a bit. Never mind that the map was first published 18yrs ago by a for-profit consulting firm and the term "mandate" is likely deliberate hyperbole used by the author. The whole map is hyperbole. Although, he is claiming that this map represents "what might have been" had he not been there to save the day. 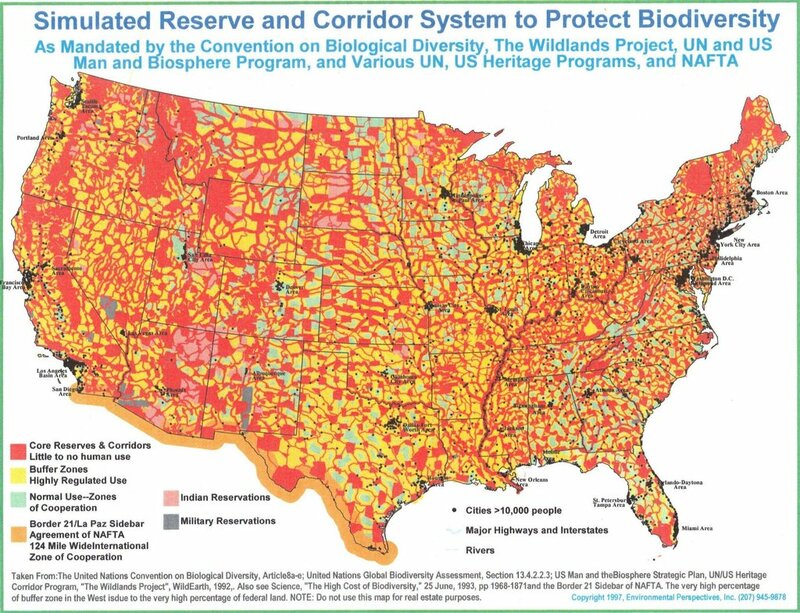 These maps show how up to 50% of America might have been set aside in wilderness reserves and buffer zones if the Biodiversity Treaty had been ratified by the U.S. Senate. Less detailed versions of these maps were used to stop the ratification of the treaty on the Senate floor 1 hour before the Senate voted on the treaty. I think the map's (author's) intention was to spread fear. Fear of UN "mandated" taking of private property. Sometimes the media gives impression is given of vast urban sprawl in the US, and similar in the UK only a small percentage is urbanised. yes. If you look closely at the map- a lot of the red is in parts that are already wilderness and open land. Much of the Western US is already federally owned and sparsely populated. Indeed, in the state where I am currently (Montana), it is roughly the size of Germany (slightly bigger) yet has a population of less than 1 million. But this map is nothing more but one man's interpretation of his worst case scenario. The Mr. Coffman produces a fair amount of material- but seems to be very far right if not over the edge and down the hole. The American Heritage Rivers (AHRI) and the Clean Water (CWI) initiatives are a direct product of Agenda 21 and the President's Council on Sustainable Development (PCSD). Signed by the US during the Earth Summit at Rio de Janeiro in 1992, Agenda 21 is nothing less than a 40-chapter manifesto to reorganize the world to protect earth using pure socialist principles. The goals and objectives of Agenda 21 were developed into a US strategy by the PCSD and published in a report entitled Sustainable America in 1996. Following the worldwide implementation of a UN-led program called Agenda 21, the once-proud people of America have become obedient residents who live in barren, brutal Compounds and serve the autocratic, merciless Authorities. Dr Coffman passed away in July 2017. Infowars recently found out about the loss of Dr. Coffman, who explained how the globalists wanted to restrict world populations to tightly controlled megacities in the Alex Jones documentary Endgame: Blueprint for Global Enslavement. Coffman, who held a Ph.D in Forest Science, was once instrumental in stopping the ratification of a biodiversity treaty which would have triggered the eventual disappearance of private land ownership through piecemeal use restrictions. It seems like his website has gone too, I've updated the OP with archive links. I'm unfamiliar with Agenda 21 and this thread, but did a quick Google image search to find background info and Metabunk was #1 in the non-paid results! is my point. Neither do the proponents of this treaty. I really wonder how much of this type of thing was actually people who were ideologically opposed to federal and UN power, and how much was the result of astroturfing by energy and resource companies. What are the connections? "Property Rights Congress": MECRI was one of prime organizers of the new coalition, which met in Washington, D.C., this year. Sovereignty International: This organization devoted to protecting the sovereignty of the U.S. is headed by Dr. Michael Coffman (religious activist focusing on the Wildlands program) of Maine and Henry Lamb (international activist on UN issues and publisher of EcoLogic) of Tennessee. "The Maine Conservation Rights Institute (MECRI) is a non-profit 501(c)3 education organization committed to the application of innovative conservation methods within the context of private property and free market systems." "First: To inform the public of the reality that conservation methods can succeed best when the rights of individual landowners are protected as a Constitutional civil right. "Second: to educate all citizens of the threat by preservationists and bureaucrats to deny the Constitutional rights of individual landowners to prudently use their land without bureaucratic interference. And management by bureaucratic mandate is a threat to everyone!" What was this key role? Did he make the map specifically for this? Did MERCI just happen to have it with no real connection to him? How did it get to Senator Huchison? Former Director - Robert O. Voight was the founding president of the Maine Conservation Rights Institute, founded in 1990. Bob, a 22-year veteran air-force pilot, also organized the Sustainable Freedom Coalition which spawned Sovereignty International. As Congress reconvened, the Environmental Conservation Organization mailed letters to 1050 Mayors, urging them to oppose the Treaty. On September 19, every Senator received ECO's letter opposing the Treaty, co-signed by 293 organizations. Mitchell announced on September 27, that the Treaty would be rescheduled for a vote, but did not specify when. Michael Coffman again issued another fax alert through the Alliance for America network. The Blue Ribbon Coalition, Chuck Cushman's Private Property Rights Alliance and dozens of other grassroots organizations refaxed the alert. Once again, Senate switchboards and fax machines were overwhelmed. The following day, Coffman was again in Senator Mitchell's office explaining that the Treaty was the embodiment of the Wildlands Project and that the "smoking-gun" evidence was contained in the Global Biodiversity Assessment (GBA). Coffman and Bob Voight, President of Maine Conservation Rights Institute, met with Senator Cohen with the same message. Both Mitchell and Cohen agreed to get a copy of the GBA. September 29, Mitchell announced that the vote on the Treaty would occur at 4:pm the following day. ASI received a copy of the peer-review draft of Section 10 of the GBA and immediately overnighted copies to Lamb, Coffman, and selected Senate Staff. Ironically, the Chicago Tribune reported on September 30, that the GBA did not exist. A front-page article by Jon Margolis denied the existence of the very document that was delivered to key Senators the same day the article appeared. Similar stories appeared in the Washington Post, and other newspapers within a few days, suggesting the influence of the White House "spin team." Coffman prepared color maps illustrating the impact of the Treaty on the northeast, including Mitchell's state. The maps were overnighted to Mitchell's office, and to the Republican Policy Committee and arrived the morning of September 30. Senate staff enlarged the maps into 4-foot by 6-foot posters, along with enlargements of selected text from the GBA. As recorded in the Congressional Record (S13790), Friday, September 30, Senator Kay Bailey Hutchison (R-TX) rose on the Senate floor with Coffman's maps and GBA text excerpts to oppose the Treaty. Senators Burns, Craig, Helms, Nickles, and Wallop also spoke against the Treaty. Bob Voight had once worked on one of Mitchell's campaigns and had become a friend with Mitchell and some of Mitchell's staff. Voight called Mitchell's office during the morning of September 30 in a final attempt to get Mitchell to withdraw Treaty. Voight believed that if Mitchell knew that the UN had lied about the existence of the GBA, Mitchell would withdraw the Treaty. Within an hour, and about an hour before the Senate debate, Voight received a call from Mitchell's office reporting that the Treaty would be withdrawn. The Treaty was withdrawn from the Senate calendar and has not yet been rescheduled for a vote. It is not dead. It can be rescheduled whenever the Senate Majority Leader wishes to reschedule it. Perhaps this account of activities will help prepare others for the next appearance of the Convention on Biological Diversity. The connection to the Wildlands Project (now Wildlands Network) seems to be most significant. The document above talks about how they saw the CBD mostly as a problem because it said the Wildlands Project was a good thing. On July 19, Dr. Michael Coffman, a Director of Maine Conservation Rights Institute, and a regional director for the Alliance for America, was in Washington talking to Senator Mitchell's staff and to Senator Dole's staff, trying to convince them that the Treaty would have the effect of making the "Wildlands Project," the objective of the Treaty's implementation. ASI produced a 100-page analysis of the Treaty which was released on July 28. The study revealed the existence of a draft of the Global Biodiversity Assessment, required by the Treaty, and the identification of the "Wildlands Project" as a primary mechanism for Treaty implementation. It seems the whole thing can be traced back to Henry Lamb, a former chairman of Sovereignty International, who here is seen giving a talk about how he discovered the supposed plot. I'd like to see page 993, to see the context. My copy of the Global Biodiversity Assessment arrived today, over 1,000 pages and 8 pounds of dense reading material. Page 993 contains Section 13.4.2.2.3, which is mentioned as a source on the map, and is also the only link to the Wildlands project. 13.4.2.2.3 Protection and management of fragments. The protection and management of natural habitat fragments requires a reduction in the deleterious effects of matrix-derived influences on remnants and an increase in the area and connectivity of habitat. Where fragmentation is ongoing, this can be achieved by ensuring that the remaining native vegetation is arranged optimally, as far as we can determine with current knowledge. This means that representative areas of all major ecosystems in a region need to be reserved, that blocks should be as large as possible, that buffer zones should be established around core areas, and that corridors should connect these areas. This basic design is central to the recently proposed Wildlands Project in the United States (Noss 1992), a controversial long-term strategy (100 or 200 years) to expand natural habitats and corridors to cover as much as 30% of the US land area. While the basic recipe appears simple and perhaps over-ambitious, the actual selection of core areas and of priority areas for reservation can be problematic, and must be linked to clear conservation objectives. A variety of reserve selection procedures is available (e.g. Usher 1986; Margules et al. 1991; Pressey et al. 1994; see also 13.2). So it seems like the Agenda 21 folk have been misquoting this all along. The Wildlands Project is a not a central theme of the GBA, it's simply that the idea of reserves and corridors is central to the Wildland Project, which is described as "controversial" and "problematic". These maps show how up to 50% of America might have been set aside in wilderness reserves and buffer zones if the Biodiversity Treaty had been ratified by the U.S. Senate. This basic design is central to the recently proposed Wildlands Project in the United States (Noss 1992), a controversial long-term strategy (100 or 200 years) to expand natural habitats and corridors to cover as much as 30% of the US land area. Looks so much nicer when the protected areas are green and not red, doesn't it?